Many believe that it doesn’t take much to write a children’s book. In other words, you don’t necessarily have to be as talented as William Shakespeare, Mark Twain or Joanne Rowling to write a book that kids will love. It seems easy because children don’t really need sophisticated language or complex ideas like many adults do. Nevertheless, creating a book for children isn’t as easy as most would imagine it is. More than that, writing a children’s book is in many ways no different from writing one for adults (in fact, sometimes it is even more difficult). You still need to create interesting characters as well as a compelling story. The difference with writing a book for kids is that everything must be presented in a way that is appropriate and engaging for readers. So the excuse “they are just kids” doesn’t really work when it comes to writing a book for children. They are not stupid readers and more than that, kids are picky about what they like to read. So if you are going to undertake the project of writing a children’s book, then you have to understand how what it takes to create a great one. 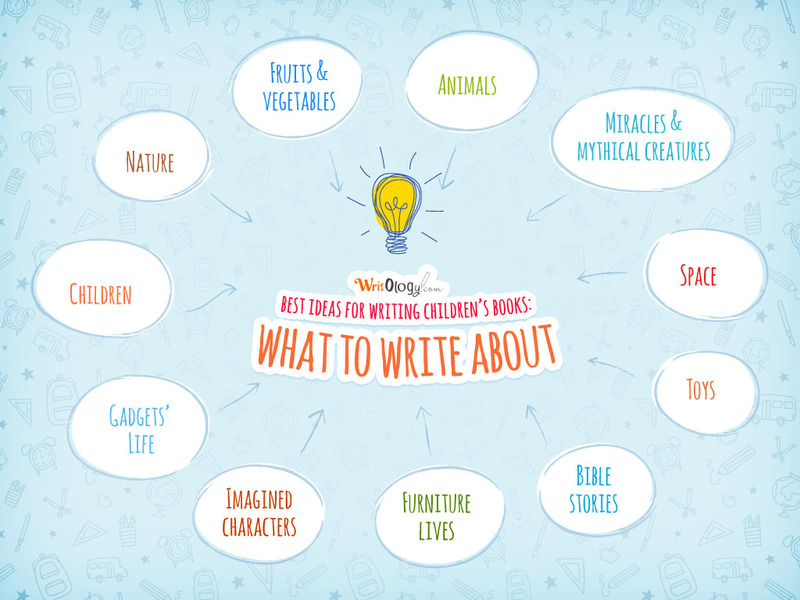 Great Children’s Book Ideas: What to Write About? Nature. Writing about nature opens a wide range of topics and possible turns that children love. A good idea is to choose the weather characters (such as Wind, Rain, Snow, etc. ), the seasons characters (such as Winter, Summer, Autumn, Spring), or nature elements (such as Leaf, Ground, Flower, Moon, Sun, etc.). Veggies. Vegetables could actually be a great source for fun stories. The beautiful and boastful Cherry or old and wise Pumpkin can make up a great book. Animals. The stories about different animals are extremely popular among children, especially those who have pets at home. The thing is that kids like such heroes as bears, foxes, rabbits, squirrels, etc. Space. Writing about stars, planets or space ships will make children think beyond their “mind box”. Who didn’t like the books about fantastic space travels and different planets? Exploring new things has always been a great entertainment for everybody. Children. You can choose to develop a story based on the life or adventures of other children. Such stories are great for teaching some lessons and kids love to read about their peers. Miracles. Children don’t look for any proofs to believe in miracles. They just believe them because they are told by adults. Besides, miracles allow creating fascinating and easy-to-follow plots. Bible. This book is a great inspiration for developing interesting stories with a teaching element. Different books of the Bible (Old Testament in particular) are rich for engaging events and great characters. Toys. Because children play with toys every day, it can be exciting for them to read a story about one of the toys. So why not try and make the toys alive for a while in the minds of children. Furniture is not a typical area of children’s interest, but if you can give lives to such things, as furniutures, it can turn out quite a story. Imagined characters. You can create characters from scratch and that is absolutely fine. Just make sure the characters are understandable for children. It requires more skills and understanding of children’s thinking though. Electronic devices. Kids today can hardly live a day without modern technologies. Therefore, writing a story about a smart phone or tablet can be very entertaining for kids of different ages. These are some ideas you can use for writing books for children. Keep in mind though that any of the aforementioned ideas can turn into a boring story if the writer doesn’t follow basic principles for writing great books for children. There are no any secrets to it. All it takes is imagination, hard work and understanding of what kids actually enjoy. How to Start Writing a Children’s Book? There’s much to be said about developing a successful children’s books. A lot more than this article contains. But despite the fact that this subject is too wide to cover in one sitting, there are some basic rules that should help one understand key principles of success in regards to writing books for kids. Many people struggle where to start. They ask about how to start writing a children’s book because the beginning seems to be the most difficult part of the process. But that is so because the start of the entire thing shouldn’t be about writing at all. Before ever starting to write anything, there some things one should do to understand the process. First of all, it is highly recommended to read some of the books that children adore. Today it is no brainer to find the lists of best-sellers in any category. Reading the works of those who succeed will definitely help you understand some interesting things about writing this kind of books. Also, it is important to choose specific age group (target audience) prior to writing. The term “children” is way too wide. For example, books for preschoolers would be very different from those written for middle-graders. After choosing specific age group, try to get to know the kids of that age. Spend time with them to find out their interests, things that scare them and stuff that bores them to death. Besides, different age groups would have different psychological characteristics which influence how they view this world. If you take time to study those characteristics, the gained knowledge should definitely help you succeed. It is after one is through these preparations, he/she can start thinking about some ideas for children’s books or writing rules. All of the preparations listed above can make a huge difference. Once again, many people ignore the fact that children are smart and picky. Therefore, writing books for them isn’t as easy as drinking a glass of water. The process requires preparation, knowledge and really hard work to make the book engaging. Principle 1: Use Pictures. If you remember yourself holding a book as a kid, most likely pictures were the things you were looking for in the first place. And that is OKAY. Children love pictures and there is no reason why this reality should be ignored when writing a book for kids. Principle 2: Keep the Language Clear, Simple and Rich at the Same Time. Each and every word in your book should be easily understood by readers. No sophisticated words needed. Mostly plain language would do the trick. However, the language should be rich at the same time so sometimes it is a good idea to use the words kids don’t know (that’s where parents have to step in). Principle 3: Keep it short. Don’t even try to write a 200 page book. No child will attempt to read it anyway. Depending on your target audience, you would probably want to have somewhere from 1,000 up to 40,000 words. Different age groups can manage with different number of pages so you have to know where to stop. Principle 4: Go Beyond. If you choose to write about things children know and experience every day only, it is most likely the book will turn out to be very boring for them. Instead, challenge your readers to go beyond their thinking box and follow their curiosity. This will make your story much more entertaining if you make the readers to ask questions. Principle 5: Easy-to-Follow Plot. It is important to write a book that kids will be able to remember easily. This is usually achieved by developing a plot and characters that are easy to follow. If you stick to these simple principles, you will be half way to writing an engaging book for children. However, these are only general rules, which do not give any specific ideas about what to write about. With this in mind, we decided to list some ideas for writing a children’s story or book. Obviously, the list isn’t comprehensive and could be easily extended but even in this shape it should give you a clue which way to go. Each of these ideas can be developed in many ways. One can use them as it is listed while others can adjust and modify them to develop their own. If one follows the aforementioned principles and rules, children’s book writing will be much easier. However, no easy walk is ever guaranteed. Despite the fact that writing a kids’ book isn’t so simple, the process can actually be quite fun. The thing is that writing something that is engaging for kids is usually entertaining for adults doing it. More than that, seeing a kid read and enjoy the book that you wrote makes all the efforts worth it. So it isn’t about hard work only, there is actually fun and entertainment along the way.